As every visitor to a decent steak house knows, creamed spinach is de rigueur: you've gotta have it. True, it may be a cliché dish, but if you can master it to the point that you can make it your own, it's a fun dish to prepare. 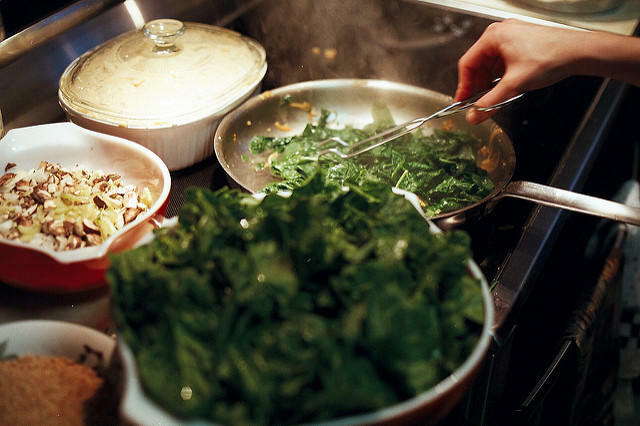 In the course of whipping up a dish of creamed spinach, you're going to learn a couple very important techniques. First of all, do yourself a favor and use baby spinach. Older spinach has those inconvenient tough gnarly stems that you have to laboriously cut out. So go with the tender, eat -'em-all-up baby spinach. Everyone knows that spinach wilts dramatically when you cook it in hot water, and that can happen quickly, say 45-60 seconds. Two tricks will stand by you: first, as soon as the spinach has shrunk, take it out, drain it and douse it with cold water to stop it cooking. This will preserve the pretty green color. Second, to get rid of all that water, pick up handfuls of cooked, waterlogged spinach, and squeeze the liquid out of it. Yes, you will be making a sort of green snowball that is much tinier than the big clump of spinach you started with, but it will give you a better product. And don't worry, once you start working with the compressed spinach it will start to loosen up and take up its proper volume. When I make creamed spinach I like to pull it apart coarsely, then cook it, drain it, squeeze it, and then chop it as finely as I can. I think it's a good idea to sweat onions, shallots and garlic in butter over low heat, taking care not to scorch the garlic. Since I want a thick sauce I prefer half and half as my base liquid, and then I add a little grated provolone cheese, and stir it until it melts. Seasonings include salt, white pepper, a pinch of cayenne pepper and nutmeg to taste. You can also grate a little parmesan cheese over it as a final garnish. Another favorite way of serving spinach is a sort of Americanized version of the Indian classic Palak Paneer. This is essentially creamed spinach as a curry with the addition of crushed tomatoes and a wide variety of spices, and small cubes of Indian paneer cheese. To begin, I cook my spinach and go through the draining, squeezing process. In a deep pot I sauté onions in peanut oil, and add cumin, cayenne pepper, turmeric fenugreek powder and garam masala to make my curry sauce. Into the pot I add the cooked spinach, and a 14 ounce can of crushed tomatoes with its juice. After heating the mixture through, I use a submersible blender to puree it, getting as fine a texture as I can. I check the seasoning, then stir in a little cream to thicken the purée. Finally I stir in the cubed paneer cheese, which will semi-melt. The last time I made palak paneer, I didn't have any paneer, so I used cut up Jarlsberg cheese. It worked wonderfully, although purists have every right to scold me. The goal is to end up with a thick, fine textured purée that you can serve over steamed basmati rice. It's a very good vegetarian dish that's loaded with nutrients. And one final idea, and that's spinach ravioli. Assuming you can make your own pasta, we'll pick it up with the filling. Cooked shredded spinach, a raw egg, some ricotta cheese, maybe sautéed onion or shallots and your favorite seasonings all go into a bowl and are mixed thoroughly. No further cooking required. Just lay dollops of the spinach mixture on a sheet of fresh home-made pasta, cover the whole works with a second pasta sheet, and use a cooking cutter to make your raviolis. Cook in simmering water until the raviolis float. Nothing could be simpler or more impressive.